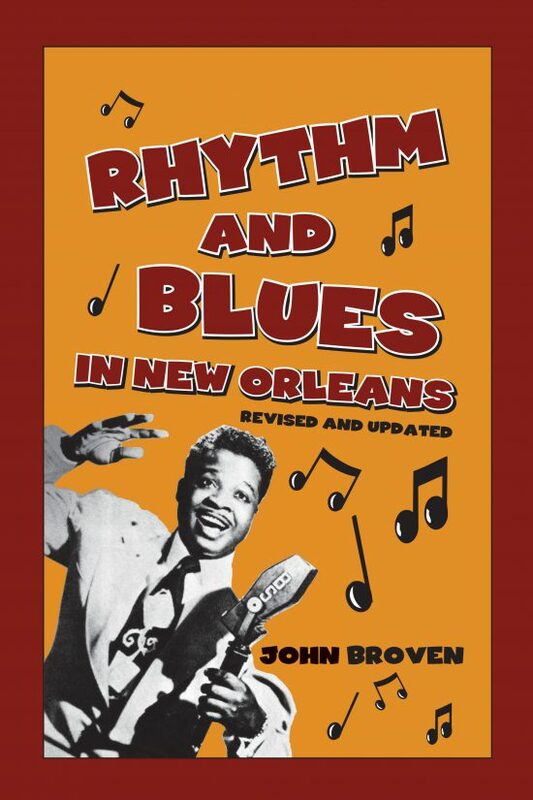 If you don’t already own one of THE seminal books on New Orleans music history because the story it told ended around 1978, now you don’t have an excuse — because John Broven’s Rhythm and Blues in New Orleans is back and better than ever with a fresh 2016 makeover. A tireless trumpeter of all things Louisiana, Pelican Publishing Co. of Gretna has released a revised, enlarged, and updated edition that markedly improves upon the original. And that’s saying something, considering that Broven’s book was named a Classic of Blues Literature by the Blues Hall of Fame in Memphis as far back as in 2011. Broven set the template for Louisiana musicology with his R&B-centered debut (originally published in England in 1974 as “Walking to New Orleans: The Story of New Orleans Rhythm and Blues” before being picked up in 1978 by Pelican) as well as his follow-up effort, South to Louisiana: The Music of the Cajun Bayous (Pelican, 1983). 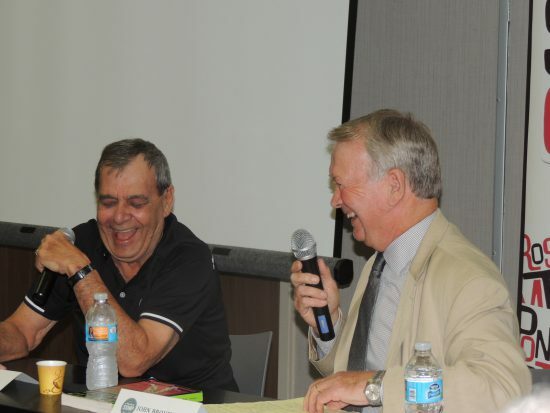 John Broven, right, interviews swamp-pop legend Gene Terry at the 2015 Ponderosa Stomp. Before Broven came along, long-form scholarship on local R&B and rock ’n’ roll was practically nonexistent. His work, based on interviews with the musical progenitors themselves, provided a road map for the host of equally influential books that would follow, including “Up From the Cradle of Jazz: New Orleans Music Since World War II” (Berry, Foose, Jones) and “I Hear You Knockin’: The Sound of New Orleans Rhythm and Blues” (Jeff Hannusch), to name a few. How does the new edition differ from the old one? First off, though a paperback, it’s heftier, weighing in at 358 pages versus the 250 pages of its 1978 counterpart, thanks to newly mined material from Broven’s interviews with Danny Barker, Dave Bartholomew, Harold Battiste, Roy Brown, Bobby Charles, Frankie Ford, Paul Gayten, Joseph “Smokey” Johnson, Joe Jones, Cosimo Matassa, and Earl Palmer, among others. And in addition to making needed corrections, Broven says he also took Earl King’s advice and edited some of the original interviews to improve readability and clarity. New photographs, some from Broven’s personal collection, also dot the book and are interspersed throughout, a change from the older editions, which collated the photographs together in three-page increments. The images include those of Fats Domino, Esquerita, Clarence “Frogman” Henry, Little Richard, Matassa, Huey “Piano” Smith, and more. Broven also revised and expanded the appendix, which now includes a new biographical-data section; a revamped rundown of Billboard chart-performance milestones; a recommended-listening section that incorporates the compact-disc era with its slew of invaluable reissues; an updated bibliography of books and articles published since the 1970s; a listing of musicology Web sites such as “The Cosimo Code”; and a new notes section with color commentary by Broven that embellishes the main text. Padnos also reflects upon his own love affair with New Orleans music that began during his days as a Tulane University undergraduate; acknowledges new musical movements such as bounce and hip-hop; and high-fives bedrock cultural sustainers such as WWOZ and the Louisiana Music Factory — not to mention the Ponderosa Stomp itself. 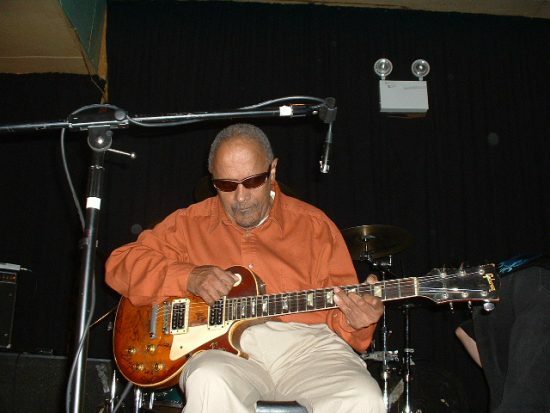 “While New Orleans rhythm and blues will stand the test of time, many of the pioneering artists and musicians who created it are no longer available to perform it; death and illness have decimated their ranks,” Padnos laments in explaining his rationale for founding the Ponderosa Stomp with his fellow Mystic Knights of the Mau Mau — that is, to give the remaining torchbearers a dignified forum for their too-often-unsung artistry. Unlike so many of the trailblazers of New Orleans’ indigenous sound, Broven has lived long enough to see the R&B genre attain a modicum of the respect and acclaim it lacked when he wrote the first draft of this book. 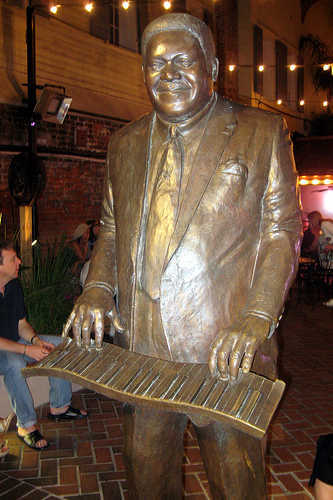 Fats Domino statue at Legends Park on Bourbon Street. Broven has done a fantastic job of modernizing his landmark tome, ensuring that this new edition will serve, for years to come, as an indispensable printed guide to the classic post-World War II sounds of New Orleans. Even if you already own an older edition, the improvements engineered herein merit inclusion in your collection. And if you don’t already own this book, the 2016 version is now the definitive, must-have edition for anyone interested in the cultural history and musical contributions of one of America’s greatest cities. No excuses: Buy this book!